I haven't told you all this yet, but one of my goals in 2012 is to have more regularly scheduled posting on the blog. In my fantasy world I would like to post 5 days a week. But in the real world I thought I should just commit to 2 days to start. Since January rolled around I've been trying to post every Tuesday and Thursday and then a few Sundays have been thrown in for good measure. As you can see, today is not any of those days. It's Friday. I'm a little disappointed that I'm day late so early on in the game. I don't even have a good excuse. I had the pictures for this post done last weekend. I knew this would be a busy week and I should have written the post ahead of time. But my usual procrastination set in and things came up. You know, life, work, family, my cats, a business trip to Las Vegas.....and in between all that I've been completely consumed with reading the Hunger Games whenever I can get a chance. Have you read this book yet? It's addicting. It's actually the first in a trilogy and I'm already on to the second. But I have managed to pull myself away long enough to get this post up, even if it is a day later than I planned. Seems like this has been appetizer month around our house. Between New Years and football games we've tried several new appetizers over the last few weeks. This roasted red pepper crostini was born out of the need to get rid of some peppers that were reaching their peak ripeness in our fridge. After an internet search on "red pepper appetizers" I was quickly intrigued by this recipe I found on Williams-Sonoma's website. Hubby and I love traditional pesto made with basil, pine nuts, garlic, Parmesan cheese and olive oil. This sounded like a fun twist, using roasted red peppers, almonds, garlic, Parmesan cheese, olive oil and parsley. It has bold, strong and somewhat spicy flavors. Since the garlic is raw, it, along with the cayenne, add a nice spice layer to the pesto. The texture is rich and thick and easy to spread on the toasted baguette. The Williams-Sonoma recipe makes it even more decadent by starting with a layer of goat cheese on the crostini and warming it in the oven before topping it with the pesto. Since Hubby and my father-in-law aren't cheese eaters, I skipped that step. But it's noted in the directions below and next time I make this I will do a few with cheese for me. The recipe makes just over a cup of pesto. One other note, I actually used 1 red pepper and 1 yellow pepper which is why the pesto is more orange and pale in color (but not in flavor!). If you have any leftover pesto (which we did not), it could be used to turn a sandwich or homemade panini into something special. It would also be great with pasta (but you would have to make a whole batch just for that) or it could also kick up a steamed vegetable, like broccoli. Since I skipped the goat cheese, I served our pesto and crostini separately and let people put as much or little as they wanted on top. If you are looking for a fresh bold appetizer for your next football watching party, this is a great choice. Preheat oven to 350 degrees and place the slices of bread on the baking sheet. Lightly brush the top sides of the bread with the olive oil. Bake for 10-12 minutes until bread is toasted. Bake 3 minutes longer for very crispy bread. When bread comes out of the oven and is still warm rub each slice with one of the cloves of garlic. Set aside. To make the pesto, place 2 tablespoons of extra virgin olive oil, the remaining clove of garlic, peppers, almonds, Parmigiano cheese, 3 tablespoons of the parsley, lemon juice and cayenne pepper into a food processor and pulse until the pesto is thick but somewhat smooth. Pulse longer for a smoother pesto. Season with salt and pepper to your taste and pulse a few more times to fully combine. When you are nearly ready to serve pre-heat your oven to 350. Spread goat cheese on each crostini and bake for about 5 minutes until the goat cheese is soft and the bread is warmed through. 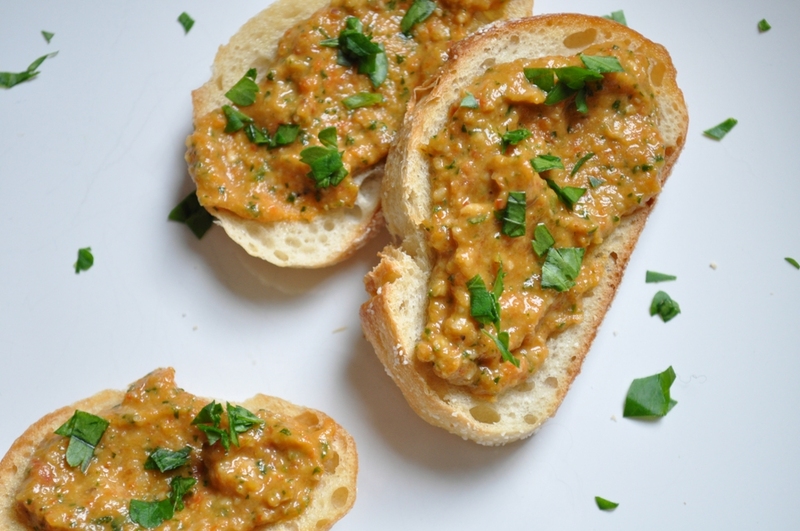 Top each crostini with the red pepper pesto and sprinkle with remaining parsley. Serve immediately. *We roast our peppers on the barbeque. Just place the peppers directly on the grill over high heat and turn every 5 minutes until peppers are soft and the exterior skin will turn black. Takes 20-25 minutes. Transfer the peppers to a bowl and cover the the bowl with plastic wrap. Set aside and let the pepper steam for about 15 minutes. Remove the plastic and let the peppers cool enough to handle them. Remove the skins, stems and seeds. Do not rinse the peppers under water. Oh, and big fan of the Hunger Games too - I'm on the second book as well! I do love red peppers, this looks great. Our book club is reading Hunger Games next month. I've heard great reviews, can't wait to read it. Gloria, this looks delicious! I love nibbles and appetizers and there really is no reason not to do it more often. I often roast red peppers (an old Serbian habit that is hard to break:) and making this spread would be easy. So, your husband does not like chocolate and does not eat cheese? Can I have his portions? I cannot say "no" to cheese, even though months can go by without me trying anything sweet (I do make it for the rest of the family).